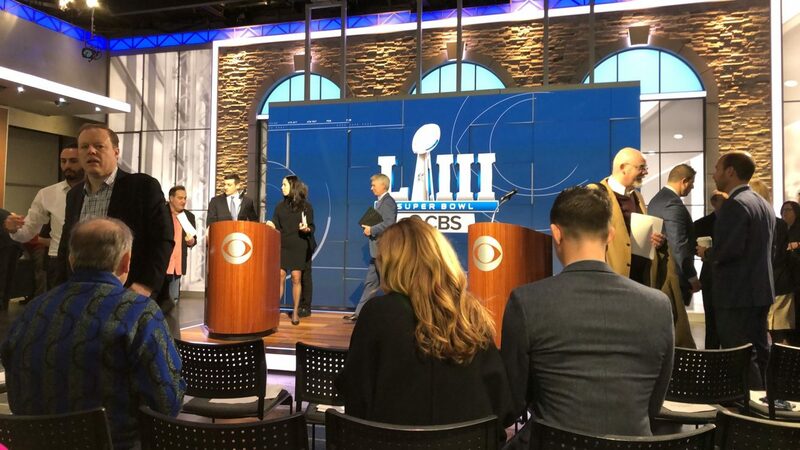 With only 20 days and four teams remaining until the biggest professional football game takes place in Atlanta, CBS Sports is looking to blow the lid off Mercedes-Benz Stadium in its 20th Super Bowl broadcast. Although the Eye Network has hosted the spectacle more times than any of its broadcast competitors, it is poised to move the chains of technological innovation with the use of augmented reality on wireless handheld cameras, an army of 8K and 4K cameras, and much more. CBS hosted Super Bowl LIII Media Day on the set of The NFL Today last week in New York City. Most fans are intrigued by the action or by the commercials during timeouts, but those at home are in for a treat. With a past filled with notable creativity — including several firsts: an NFL Championship in color (1966), use of telestration (1982), and PylonCams (2016) — CBS will impress tech enthusiasts with a new fleet of production achievements. The reality will match the network’s boast. The 115 cameras deployed throughout the stadium to capture every large and small detail will include 16 4K cameras – nine of which will be Sony HDC-4800’s capable of 8X slo mo — and multiple 8K cameras. In another first for any U.S. network, CBS will use multiple 8K cameras to deliver close-up views of the action from the end zone, including possibly game-changing plays along the goal lines and end lines.